The eFileManager system allows a maximum file size of 35 MBs for all documents in a submission. Therefore, FileTime prevents you from completing the upload of any document that causes your file size total to exceed 35 MBs. This could be a single document exceeding 35 MBs in size or multiple documents which added together exceed 35 MBs. FileTime Displays for you the total file size of documents you have already uploaded for the submission. In Figure 1 you see that the total is 14.68 MBs. Generally, exceeding the file size limitation only happens with scanned documents as they are much larger than word processor documents that are converted directly to PDF files. If possible, upload the native Microsoft Word document to FileTime and let FileTime convert it to a more compact text-searchable PDF for you. While 300 dpi is the standard in the eFileTexas system for scanned documents, change you scanner setting down to 200 dpi and rescan your documents. This makes a file size considerably smaller. If your submission consists of one, or more filing, with multiple documents, the easiest solution is to make two or more submissions containing documents that do not exceed the 35 MB limit per submission. 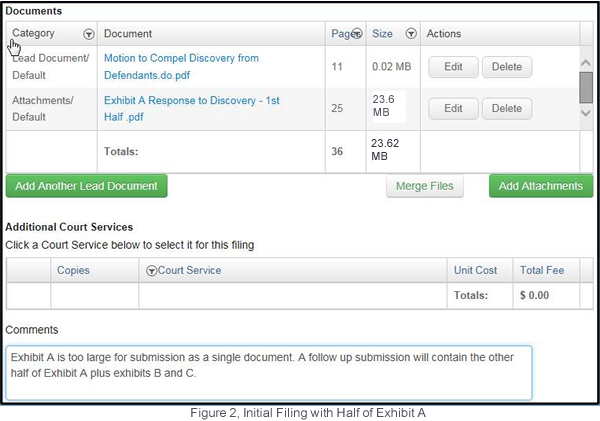 For example, suppose you are submitting two filings in a submission for a case and there are 3 documents with a total file size of 40 MBs. Filing1 contains one document 10 MBs in size and Filing2 contains two documents containing a total of 30 MBs. Submit Filing1 as a submission and Filing2 as a new submission. Use the general guidelines in B below regarding the cover letter and the submission process. Sometimes, however the issue is that a single document exceeds 35 MBs. You need to split it to two or more separate documents so that each part does not exceed 35 MBs. If you have a software program like Adobe Acrobat Standard or Professional, you can do this within the document. If you do not have this option you need to physically separate the pages of the document, rescan them and name then something like Exhibit A - Part 1, Exhibit A - Part 2, etc. Allison needs to submit a Motion to Compel (Word doc, .02 MBs), Exhibit A (scanned PDF, 39.73 MBs), Exhibit B (scanned PDF, 4.16 MBs) and Exhibit C (scanned PDF, 12.09 MBs). She decided to split Exhibit A into two parts: Part A is 23.62 MBs and Part B is 16.11 MBs). She then created a cover letter that was a simple Word Doc that stated had COVER LETTER as the page title and the body of the letter simply stated "This is the second half of Envelope Number[ ] and contains the second half of Exhibit B along with Exhibit B and C.
She then began the first filing and the uploaded documents resembled Figure 2. After she completed the initial submission she noted the Submission ID number and entered it into her cover letter for the Envelope Number. She then started the second submission to file the second half of Exhibit A plus Exhibits B and C.
She uploaded the cover letter as the lead document in jurisdictions where attachments are allowed so it receives the file stamp and then uploaded the remaining documents as attachments. 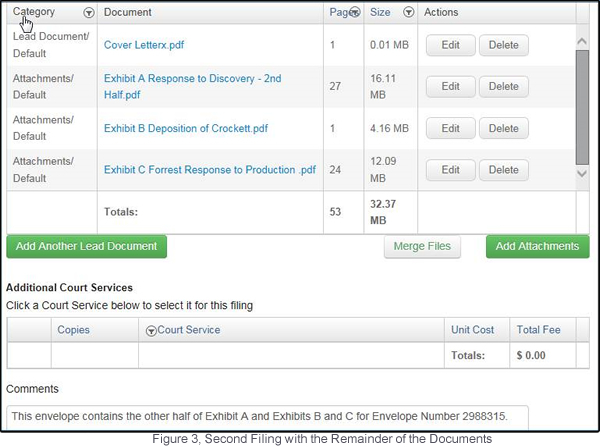 Figure 3 shows what the uploaded documents look like in FileTime. She chose No Fee Filing as the Filing Code for the follow up filings. If the jurisdiction was one that does not allow attachments, she would have uploaded each segment of the document as a lead document. Note the comments to the clerk in the Comments field. The above are general suggestions should work in most jurisdictions but each has its own requirements. The safest choice, if you do not want to risk doing all that work only to have the submission(s) rejected is to call the clerk of court for the jurisdiction and ask for instructions.